CB-400/CB-400S Safe Deployment - NexSens Technology Inc. Stainless steel bow shackles are used to connect the various mooring components (mooring lines, marker buoys, chains and anchors) together and to the CB-400 buoy. Bow shackles must be properly connected and secured to prevent hardware from loosening and becoming detached over time in rough water conditions. After hand-tightening a bow shackle, use a crescent wrench to tighten the connection. Then, run a cable tie through the hole on the shackle pin and run this through the loop of the shackle. Pull tightly to secure. 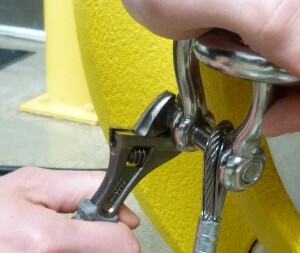 A 1/2” bow shackle is used to connect mooring lines to the CB-400 buoy eye nuts and to 1/2” bottom chains. Larger, 5/8” bow shackles are required for connection of marker buoys and anchors. Deployment of a single-point mooring system is a fairly straightforward process. 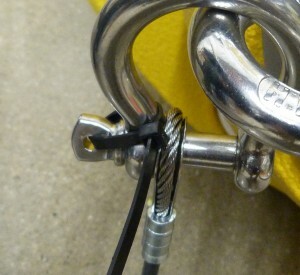 With the buoy in the boat, begin by connecting all mooring hardware (see Section 5.2) including the connection of the mooring line to the bottom eye nut of the CB-400. Next, with the buoy still in the boat, lift the anchor over the side of the boat and drop in the water at the chosen deployment location. Be sure that the mooring line and bottom chain assembly is long enough that dropping the anchor does not pull the buoy over the side of the boat. Finalize any sensor connections and apply power, then lift the buoy over the side of the boat and set in the water. Deployment of the system is complete. For deployment of a two- or three-point mooring system, first connect all mooring components inside the boat. Navigate to the chosen location for the first anchor. Lift the anchor and marker buoy over the side of the boat and drop into the water. Be sure that the mooring line and bottom chain assembly is long enough that dropping the anchor does not pull the buoy over the side of the boat. Then, move to the location where the buoy will sit. 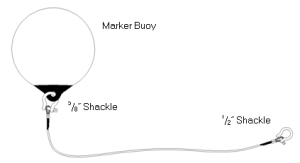 The distance from the position of the first anchor to the buoy location is determined by the lengths of the mooring lines that are attached. Pay out the mooring line from the marker buoy to the CB-400 as the boat is moved. Finalize sensor connections and apply power, then lift the buoy over the side of the boat and set in the water. Move onward to the location of the second anchor. Lift the anchor and marker buoy over the side of the boat and drop into the water. Repeat this process if a third mooring point is to be used.